Upon reflection of my golf trip to Cape Breton Nova Scotia I not only break out in a smile when I think of the great golf courses I played (The Lakes, Highland Links, Le Portage and Cabot Links) but all the little things that made the golf experience even better. Here are just a few things you might want to try if you are in Cape Breton. A perfect way to end your round, Cabot Links clam chowder is a tasty meal in a bowl. Sitting on their outdoor patio enjoying a cold pint and taking in the sunset is just about perfection. If you've never seen whales in their natural habitat before whale watching at Cheticamp is a must. After a round at Le Portage I can't think of a better way to end the day with a evening whale watching tour from Whale Cruisers. It was my wife's first whale experience one that she'll never forget and one my kids can't wait to do. Definitely beat my whale watching experience from a few years ago on the West Coast. A great place to head after a tough round at Highland Links is the Main Street Restaurant & Bakery in Ingonish Beach. You can feast on all things seafood. 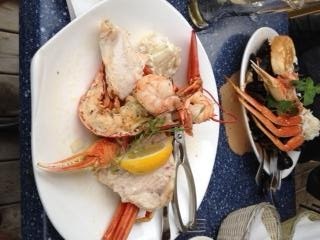 On my plate below a Lobster, Shrimp, Snow Crab, Shark medley, my wife had a lovely Seafood Pasta. Topping it off with a peace of fresh Coconut Cream Pie was the end of another perfect day on the Cabot Trail. Even if your not a whiskey connoisseur the Glenora Distillery Tour is downright interesting. Made from water from MacLellan’s Brook Glenora is home of Glen Breton North America's 1st Single Malt Whisky. The shots of whisky at the end of the tour are great too. Looks like quite a course. I wish I could play it.